1. Some of the December special offers have been continued into January so you can still upgrade from any earlier version and get some of the bonus items that were available in December. This applies to Delphi, C++Builder and RAD Studio. 2. If you haven't tried the new C++ mobile development capabilities yet, download a trial of C++Builder XE5 or RAD Studio XE5 and give them a try. If you did a trial earlier when XE5 was first released, you can try it for another 30 days with the new C++ mobile features. This is a special exception to the usual single trial per user. Now, you can visually create iOS apps coded in C++ that compile direct to the CPU, delivering higher performance, security and a better user experience. 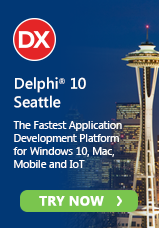 Your apps can access iOS device APIs, sensors and services. 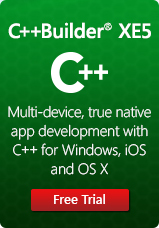 You’ll be amazed at how quickly and easily you can develop mobile apps with C++Builder XE5. Don’t miss this opportunity to add iOS to your app development skill set! Tim, how do iOS C++ applications coded using C++ Builder specifically provide "higher security"? Tim, I'm sorry, but you just answered one fact-free claim with another claim. :-( Secure from what? How? Why? There have been many articles written on topic. For example, see HTML5 hard truth No. 1: Security is a nightmare at http://www.infoworld.com/d/html5/11-hard-truths-about-html5-169665?page=0,0. There are also other factors like native apps going through extra security checks as part of the approval process to be distributed through app stores where web-based apps (those not packaged up as "native" apps) don't.